So, you just bought a cute character home in a central neighbourhood. Tree-lined streets, beautiful architecture and a short commute to work – what’s not to like about that? Enjoy the honeymoon while it lasts – a few years in, you might be longing for a newly-built suburban house. Once a structure passes its tenth birthday, its systems and appliances start to have issues. 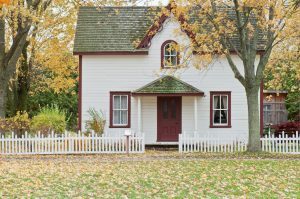 In a house older than that, improper maintenance can cause problems that will wreck your finances. For instance, asbestos remediation can cost as much as $30,000. A termite infestation can require upwards of $4,000 to quell, and you’ll spend up to $10,000 to fix the damage. So, should you give up on your dream of owning a stately older home? Of course not! You can contain costs in many ways. By being diligent about home inspection, you can avoid missing hidden ‘surprises’. On top of this, a home warranty contract can help mitigate the costs of wear & tear. Below, we’ll show how a home warranty can save thousands per year on repairs in your old house. Think your homeowner’s insurance has you covered? Let’s correct this misconception right off the bat – insurance does not cover wear and tear claims. If the wiring in your home short-circuits, cutting power to the 2nd floor, your policy won’t pay for it. How can this be? After all, extensive electrical work can cost upwards of $20,000 to perform. While this can be financially crippling, homeowner’s insurance is meant to protect its holder from unforeseen disasters. While insurance providers exclude ‘Acts of God’ like floods, they cover you when thieves strike and fire breaks out. You can’t predict these things – but issues arising from maintenance can. Appliances and home systems have a well-established lifespan – as such, a prudent homeowner can plan for their repair. Because of this, no homeowner’s insurance policy will cover maintenance, no matter how expensive the cost. This fact leaves many homeowners in a jam – in today’s world, it’s tougher than ever to save money. A recent survey conducted by the Federal Reserve revealed that 40% of Americans can’t cover a $400 expense. Another report uncovered that almost 80% of Americans live paycheck to paycheck. Unless you make more than 100k per year, how are you supposed to sock away a maintenance fund? Most of us can’t. That’s why more Americans than ever are opting for a home warranty. The home warranty: what are they and what do they cover? What on Earth is a home warranty? It is a service contract that offers predictable home maintenance costs. Anytime something goes wrong, you call your home warranty company, and they’ll send a technician to fix the issue. What do home warranty companies cover? Plans pay for maintenance of two areas of a household – systems and appliances. The scope of these contracts varies widely from one company to another – one firm may cover humidifiers, while others don’t. Some will allow for up to $3,000 in repairs to air conditioners, while other companies only have a cap of $500. Virtually all systems plans cover climate control, plumbing, and electrical. If you shop around, though, you can find ones that also protect things like sewer lines, sprinklers, and ductwork. As for appliances, every top plan protects fridges, stoves, and dishwashers. However, some companies offer more comprehensive coverage, as some may pay for trash compactor, air cleaner, and ice maker repairs. Before contacting a firm, identify everything system and appliance in your home. Then, check home warranty reviews online – they’ll highlight the companies most likely to meet your needs. Getting a quote is the next step in the process. But, how much should a home warranty cost per year? According to consumer advocate groups, the average home warranty costs between $300-$600 per year. Even for an older home (50+ years), you can find annual deals for less than $1,000. As opposed to maintenance emergencies, which can cost thousands up front, all you pay is a monthly/yearly premium. Whenever the home warranty company sends a repair person to your home, you pay an additional service fee, which averages $60-$125 per call. You’ll pay anywhere between a few hundred to a little over $1,000 annually for a home warranty. We don’t know about you, but this is better than suddenly having to find $4,000 to re-wire your home. Which home warranty policy is best for me? Home warranty companies offer an endless variety of plans, designed to suit different homeowners. If this is your first time shopping for a home warranty plan, it can be tough to pick the one that best suits you. Start by evaluating the age of your home. If your home is brand new with state-of-the-art appliances, you probably won’t need a home warranty. The cost of the odd repair will be far less than the premium you’ll pay. Conversely, if you bought a house more than ten years old, consider getting a home warranty. At this point, home system and appliance components begin to experience serious problems. According to models, it is more cost-effective to get a home warranty than to pay for repairs out-of-pocket. Next, check out review sites that evaluate home warranty companies. By reviewing the top home warranties on the market, you can find something that matches your needs and budget. For example, if you live in Texas, termites can be a huge concern. This fact should elevate Landmark Home Warranty, as they offer up to $700 coverage for pest fumigation calls. On budgetary matters, don’t just consider premiums and service fees, but coverage caps as well. For instance, Select Home Warranty covers up to $2,000 of heating system repairs under their Gold and Platinum plans. However, those with Landmark only enjoy $500 coverage – every dollar above that comes out of your pocket. Finally, review customer reviews and feedback. Going in, know that these will skew negative – most people aren’t compelled to write reviews when things go right. Nonetheless, you’ll pick up on recurring trends that may disqualify some providers. You can find these reviews on sites like Trustpilot, Google, and Yelp. Sort for 4-star reviews to learn about a company’s strong suits, and 2 to 3-star reviews for shortcomings. Avoid 5 and 1-star reviews, as raves and rants contain little valuable data. Who gets the most out of a home warranty? So, who is best served by home warranties? Two groups stand out – owners of houses older than ten years and holders of investment real estate. As mentioned earlier, systems and appliances begin to wear out after ten years of continuous use. Let’s perform analysis using the ReviewHomeWarranties.com home maintenance calculator. If you live in a house that is 20 years old, you’ll average $1,732 per year on repairs. However, a home warranty would only cost you $650 annually. Even after five $60 service calls, you would save almost $800/year. Landlords also stand to gain from home warranties. The cost savings are evident for older homes, which investment real estate tends to be. However, the time savings they offer make them valuable even for newer properties. If you’re managing multiple units, don’t spend your valuable time fixing toilets. Sign up for a home warranty, and all you’ll need to do is call whenever something breaks. You’re no tradesperson – let the experts handle things while you move on with your day. Homeownership is an expensive endeavour. Maintenance contributes mightily to household expenses, catching many by surprise. At a minimum, home warranty companies offer cost certainty and save time. However, if you’re the proud owner of an older house, they can save thousands of your hard-earned dollars annually.